Pre-stroke I had to work hard not to drive my patient husband Walter crazy with my obsession to see everything and experience everything on our travels. His idea of a perfect trip was and still is totally the opposite. He likes to just be. Leisurely and limited touristing is okay if, and this is a crucial if, it allows him abundant opportunities to just soak up the spirit of a destination new to us and to capture that spirit via photography. The first day of our early April trip to the Smoky Mountains, however, made me realize how totally I have come to adopt hubby’s approach of “just being” since my stroke last year. 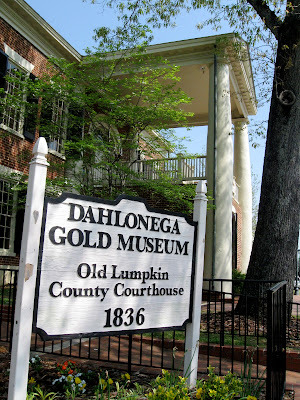 On our way to the mountains, we ventured off our usual route to check out the historic gold rush town of Dahlonega, GA.
Our first stop in this pleasant town was the square, a bustling and vibrant city center watched over by the old county courthouse which is now the Dahlonega Gold Museum. In my pre-stroke mode I would have been itching to visit the museum and the attractive shops around the square. Instead, I sat on a bench outside some of those shops while hubby went on a brief photo safari around the square. I was content and entertained as I soaked up the comfortably cool weather, sunshine, flowers and the creative details of facades of nearby shops. 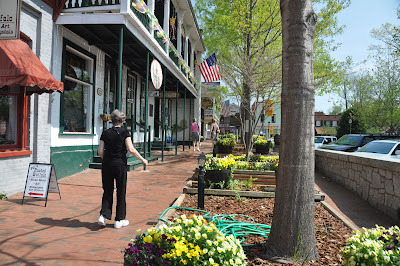 Walter captured this image of the square and of my walking unassisted. Woohoo! 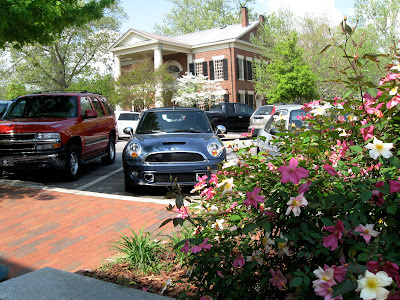 When Walter returned, we took an amble around the square, which was my opportunity to snap some memories of a delightful visit. 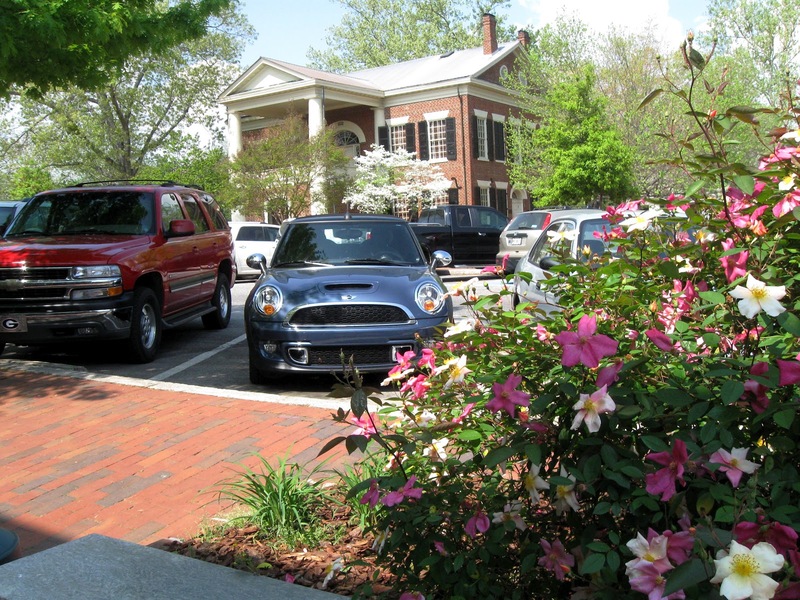 More of Walter's Dahlonega images are here. Very nice place to visit. I'm sure it all seemed a bit too tame for you in some ways, but it others, what a triumph for you. You traveled. You saw new places. You walked without any assistance. I'm so happy for you. Oh, I think we all need to learn to "just be." I'm learning! I love these pics of this beautiful place - and the pic of you walking unassisted! That's something to celebrate - even if your celebration is a quiet one!! I love this post! You KNOW my favorite picture is seeing you walk unassisted!!! congrats on walking alone! so happy for you. my friend Barbara lives in Dahlonega, they are truck drivers and on the road a lot but home base is there. i would so love to travel and see things, but i am married to a home sweet home that will not travel at all. he has no desire to see anything not where he lives. What a wonderful shot of you walking unassisted. Looking good lady. Thanks to all of you for cheering me on with your gracious comments. And Sandra, you are so good at taking advantage of everything close to home and seeing with a discerning eye and spirit things that other "locals" might take for granted. Have you ever thought about offering "for pay" photo safaris in your area? What memories your post brings back today. We lived in both Thompson and Brunswick in GA when I was a kid and visited many of the little towns at one time or another. Dahlonega...the name rolls off the tongue. Your day seems perfect with sun and flowers. Is that really you walking up the street?? Marvelous. David likes to be active. Unlike me. I prefer to sit in one spot and soak up the atmosphere or ambience of a place. Kudos to you on your walk!